By sheer chance, the Geck ambassador, one of the very few Geck to ever leave its system, catches sight of Uisine’s ship. Convinced it is one of three ships stolen from the Geck, it demands the ship’s return. When Uisine’s paperwork proves bullet-proof, the Geck refuses to abandon its claim. Instead, it follows Uisine and his passengers to Hwae. Ingray’s purpose in retrieving Pahlad from durance vile (Compassionate Removal) was to force or coerce him to return the archaeological treasures he was convicted of stealing. This would, she was sure, win her mother’s respect. The man she rescued cannot return the relics. What he can do is reveal a secret about the relics, a secret with earth-shattering implications. Alas, not the sort of implications that will make Ingray more lovable. Murder provides a much needed distraction, but not a pleasant one. If that were not bad enough, someone else’s bold scheme to resolve certain galactopolitical disputes is about to run into unexpected complications of its own. Ingray figures prominently in those complications. This is set in the same universe as the Ancillary books, but not in the Radchaai domain. The Hwae are unlike the Radchaai; they are not a mass of peasants suffering under the cruel rule of brutal aristocrats, who are themselves ruled over by an autocrat. The Hwae realm is an oligarchy whose rulers are subject to periodic elections. In fact, angling for advantage in the next election drives a good part of the plot. It’s a pleasant change from the absolute monarchies and dictatorships that infest so much of SF. Ideally, SF should not be about 1955-style societies somehow transported to the far future. All it too often, it has been. Why, it’s almost as if authors were unable to imagine arrangements very different from the ones of their youth! Leckie is not so hobbled, as the family structures in this book amply demonstrate. Fostering appears to play a much larger role in Hwae society than it does in our own. Many children are raised in crèches. Rather than relying on their own reproductive prowess, the upper-class Hwae often adopt children from the crèches. While this grants adoptees access to a high standard of living than they would have had in the crèche, only one child in any family can inherit their parent’s position. A certain amount of healthy intra-familial competition, ranging from snide comments to the occasional assault with a bulldozer, is thus assured. The system isn’t perfect — one of Ingray’s sibling ragequit the family; Ingray’s rescued criminal has an entirely different set of problems with his parent — but it seems to work well enough to have persisted for centuries. One characteristic her societies have in common with ours is that people are able to believe astounding tosh, if believing it is convenient to them. While it is true history appears inconsistently documented on Hwae, it is also clear that many people actively ignore evidence in favour of comforting nonsense. It would be hilarious if those beliefs didn’t instigate a murder. Ingray is off balance for most of the book. People lie to her, they reveal secrets at inopportune times, and sometimes Ingray is just mistaken about what is going on. The result is a very C.J. Cherryh-like novel, with two differences. One is that Ingray isn’t chronically sleep deprived (a common characteristic of Cherryh protagonists) and the other, that the prose is more transparent than Cherryh’s. I never had the impression I was reading a translation from the original knnn. This book was much more to my liking than the Ancillary books (blame my antipathy for autocracies in SF, even in the context of critiquing autocracies). I expect to see it on next year’s Hugo ballot. Provenance is available here (Amazon) and here (Chapters-Indigo). 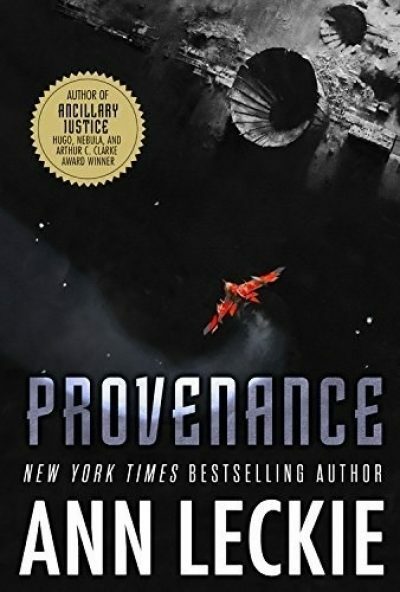 I have in mind that Provenance is a standalone novel, but cannot give you a definitive source. On the other hand I cannot find any mention that it is going to be a series. The plot leaves room for both options, while still functioning as a stand-alone. Typo alert: "All it too often, it has been."